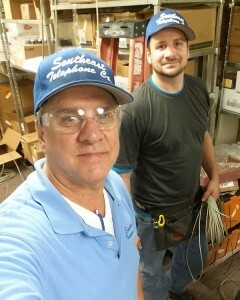 Mike Howell, known professionally as Mike the Phone Man, and his professional staff provide clients the knowledge and expertise in the installation and repair of telephone systems – even the older products – and computer networks. They are problem solvers and have the reputation to prove it. Northeast Florida and Southeast Georgia clients have come to know and trust their services for nearly 25 years. The staff is dependable and can be counted on to provide your business or residence with the telephone system and computer networking you need and require. Simply put, they get the job done right – the first time. Our company, Meridian Technologies, has done business with Southeast Telephone since we opened in 1998 (17 years). We bought our first telephone system from Mike Howell, receiving great value for the money we spent. Mike took the time to understand our business that we were just starting out and didn’t have a lot of money to spend, and got us a solution that worked great. We continued to work with Mike as our company grew. He always tried to help us find a system that we could grow a little, but not jump too far ahead and spend a lot of extra money when we did not need to. Whenever we had an issue, he was always quick to be there to help us. When his son, Ken, joined the business to work with his father, the great customer service continued. We even asked Southeast Telephone to work with us on our new offices in Charlotte, NC. They have made many trips to Charlotte to install systems for Meridian, and there has always been great customer service. They even looked out for our interests with other vendors on the construction site to make sure Meridian was not being ripped off!! Bottom line, you cannot go wrong with Southeast Telephone. They only do the best for their clients! When experience counts, call Mike the Phone Man! Southeast Telephone and Intercom offers competitive pricing with no trip charge added for local businesses, plus availability 24/7/365 for emergency service. We are safe, reliable and work with established fire codes. Ask about our Warranties and Maintenance Contracts!